It’s no secret that Harry Potter is a big deal. That’s considering the books that changed publishing forever, the billion-dollar film franchise, to the massive amount of merchandise. Last year, a professor at the London School of Economics estimated that Harry Potter was worth £4 billion to the UK economy alone. Harry Potter has been shaped by and now shapes so much of British culture, and that’s especially true of London. So much of the series was inspired by London’s quirkier areas and its literary history. Let’s take a look at some of the best. You won’t need a broomstick or an apparition spell to get to these spots—all are in central London, so the tube should suffice. 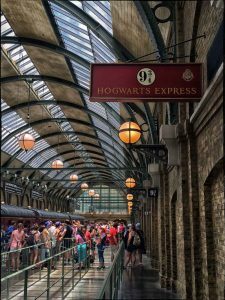 All Harry Potter tours have to start here—at Platform 9 3/4, where Harry’s adventure really begins. You’ll find it by the line of people clad in scarves, fake glasses, and lightning scars, waiting to get their picture taken with the trolley perched halfway into the brick. Skip the photo opportunity, and instead check out the station’s beautiful architecture. (The filming was actually done between platforms 4 and 5). Outside, have a glance at the entrance to the St Pancras Hotel. The outside is where Ron’s crummy flying car rumbles up and shoots off into the sky in the Chamber of Secrets. The centre of London’s chaos and frenzy, Piccadilly Circus is in a lot of movies, including the key scene in Deathly Hallows Part 1. It’s here where they apparate from Fleur and Bill’s wedding after the death eaters attack. Continue up Shaftesbury Avenue to follow in Hermione’s footsteps as they rush through the crowd, evading escape. In both the books and the films, Charing Cross Road—a street famous for its bookstores— is the doorway to Diagon Alley. You won’t find more than a passing resemblance to the scene in the movie. 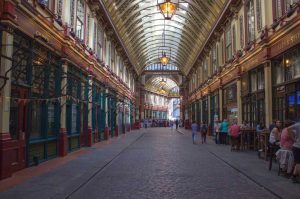 Instead, go to Leadenhall Market in City to see where they actually filmed it. Most Potter fanatics, rather, will focus on the Palace Theatre up the road, where the massively successful Harry Potter and the Cursed Child plays. Arguably London’s coolest tube station, with its sleek subterranean feel, Westminster is also the setting for one of the Order of the Phoenix’s funniest scenes. Arthur Weasley takes Harry to the Ministry of Magic, bumbling his way through the station and attracting the laughs of all the unsuspecting muggles. The knight bus barrels across this sparse West End bridge in the Prisoner of Azkaban— notably squeezing between two double deckers in the process. 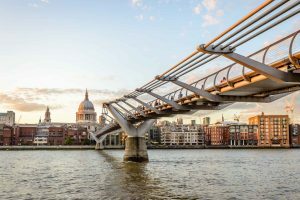 Perhaps London’s most popular bridge, the Millennium Bridge is Voldemort’s first victim in the Half Blood Prince’s striking opening: the death eaters blow it up, sending it crashing into the Thames. Head past the market itself to 7 Stoney Street, the narrow building beside the train line. It’s where the Knight Bus takes Harry. He’ll later look out from the third floor window on the market and watch the trains going by. Known as 12 Grimauld Place in the series, this quiet square in Angel is where Sirius Black’s house is. While it’s not mentioned in either the books or the movies, this tiny, slanting alley—the narrowest street in London—has plenty of magic in its own right. JK Rowling worked nearby with Amnesty International, leading some to theorise that she based Diagon Alley on Brydges Place. Looking to get out of London to see other magical places? Then make sure you check out Bath and York!